﻿Elaine started to really appreciate yoga when she had Sepsis in the hip and was unable to walk without crutches in her early 20’s. After major surgery Elaine had to learn to slowly increase the strength and mobility back into her hip. Later on (caused by a swimming pool accident), Elaine incurred a serious neck injury (whip-lash), compression in both her neck and upper spine causing restriction of the rotation and movement in her neck. After attending various yoga workshops about necks, hips and back conditions Elaine gained a great deal of knowledge and today has regained most of her mobility in these areas. Recently in 2014 Elaine needed a Total Hip Replacement (THR) due to the initial Sepsis 28 years previously - which destroyed her hip cartilage. Today she can perform many of the yoga postures but has taken care to slowly build up the strength and flexibility with remedial Iyengar yoga. Additional experience was gained when Elaine spent a month at the Iyengar Yoga Institute in Pune in 2015. She spent most days learning remedial yoga especially about back and hip yoga therapy. 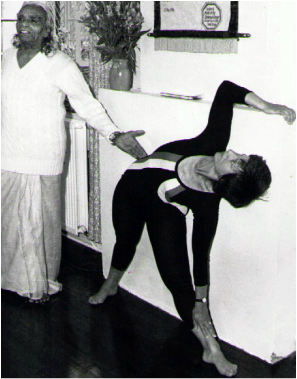 Elaine has been practising yoga from the age of 11 years along side her mother Sheila Kenton who is a Junior Intermediate teacher passed by Iyengar himself in the 70’s. Elaine qualified as a P.E. teacher in 1979 and a gymnastic coach. Often, people who take up yoga report that they feel more relaxed almost immediately. And science now says there’s a physiological explanation for that: "Yoga can reduce levels of CORTISOL, the so-called stress hormone." The findings suggest that practicing yoga—even for the very first time and at least one class per week can normalise cortisol levels that are either too high or too low. Doctors are now saying “With gentle remedial yoga it can bring the body into balance.” In addition to renewing your mind and spirit, yoga has now been proven to provide real benefits for your body. No longer do the everyday stressors of deadlines, a hectic schedule, and other pressures have to wear you down. Simply stop and attend a yoga class and let your tension decrease along with your cortisol. As with any physical activity there is a risk of injury associated with Yoga. The decision to perform any exercise remains the individual’s responsibility for any problems outside or within a class. If you are in any doubt as to your fitness, please consult a GP beforehand. Participation in yoga classes is entirely at your own risk and any loss, damage, injury or any other mishap will not be the responsibility of Elaine Liffchak. Don’t start any exercise or fitness program without carefully assessing your own state of health and level of physical conditioning. Inclusive of considering your age, any illnesses or injuries you are recovering from, doing some personal research, and if necessary consulting your personal physician. The essence of Yoga is to become your own doctor, taking responsibility for yourself!